Bridget never thought she would wind up living on the streets, pregnant and alone. But when she left an abusive relationship and had nowhere else to go, she became homeless in an instant – and she’s not alone. A Coalition for Homelessness Intervention (CHIP) 2018 study states that 80% of homeless women are fleeing domestic violence. Bridget escaped the streets and came to our Center for Women & Children in search of nourishing food and a safe place to sleep. Once her immediate needs were met, she entered Revive, our family development program. She is building a better life for herself and her son through counseling, Bible study, group classes and other life-changing services. Bridget’s mom died when Bridget was only 10 years old, which caused her to turn to drugs to cope with the devastating loss. The life skills and parenting classes at the Mission have given her newfound strength, confidence and healthier ways of coping. In our care, Bridget is strengthening her relationship with the Lord and embracing God’s plan for her life. She has restored relationships with her family and is thankful for the care her young son gets at the Mission. 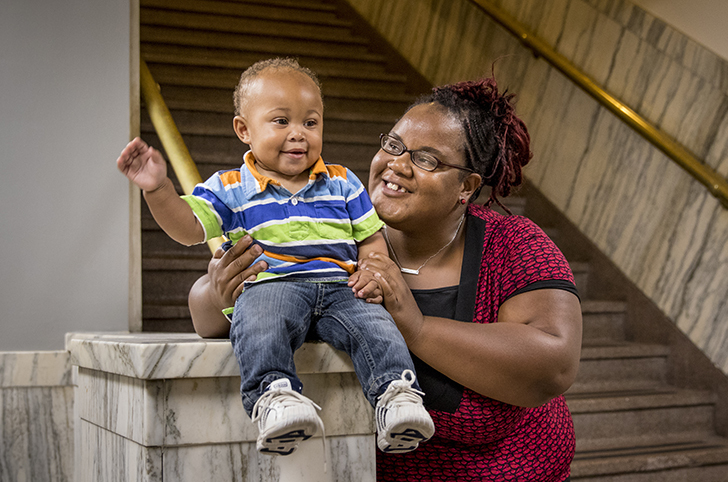 When she graduates from the program, she hopes to attend school for her degree in social work so she can help recovering addicts and their children break the family cycle of destructive behavior. She also plans to look for a place for her and her son to live. Bridget is so thankful for the lessons she has learned at the Mission, and for the support of friends like you that made her time here possible. Thank you for your continued generosity.